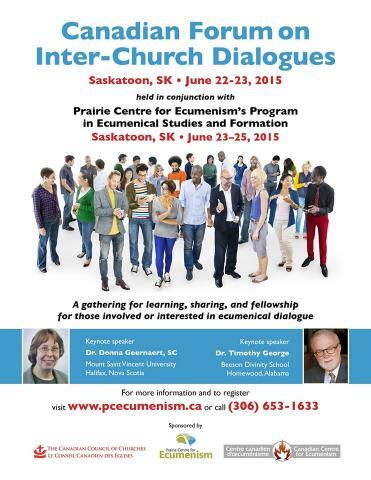 On June 22-23, 2015, the 6th Canadian Forum on Inter-Church Dialogues, sponsored by the Commission on Faith and Witness of the Canadian Council of Churches, the Prairie Centre for Ecumenism, and the Canadian Centre for Ecumenism, was held at Queen’s House Retreat and Renewal Centre in Saskatoon. Representatives of local and national inter-church dialogues gathered to share their experiences and learn from each other’s work. The organizers were especially delighted to welcome students of the Prairie Centre’s Program in Ecumenical Studies and Formation as Forum participants. On Monday evening, after opening worship and welcome, Sr. Donna Geernaert, S.C., chancellor of Mount Saint Vincent University (Halifax, Nova Scotia) and a distinguished Roman Catholic representative on national and international inter-church and inter-faith dialogues, delivered a keynote address, “The Practice and Spirituality of Dialogue”. Focusing on the Joint Declaration on the Doctrine of Justification (1999) as her example, Sr. Donna described ecumenical dialogue as a challenging yet fertile process. Through dialogue, she remarked, we can overcome theological misconceptions and mistrust and foster true Christian unity as “differentiated consensus”. Sr. Donna also reflected that the ecumenical movement should foster a spirituality of dialogue, cultivating the spirit of mutual charity and openness to the voice of truth in one’s conversation partner. Tuesday was devoted to panels and workshops, led by well-known participants in Canadian inter-church dialogues. 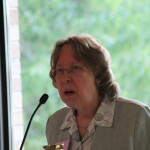 In the morning, Dr. Mary Marrocco, Associate Secretary for the Commission on Faith and Witness, moderated a panel in honour of the late Dr. Margaret O’Gara, noted ecumenical leader, beloved teacher, and a Roman Catholic representative on national and international dialogues. The panel celebrated the recent volume of essays by Dr. O’Gara, No Turning Back: The Future of Ecumenism. The panellists – Bishop Don Bolen of Saskatoon (Canadian Conference of Catholic Bishops), Dr. Paul Ladouceur (Orthodox Church in America), and Dr. Gail Allan (United Church of Canada) – spoke of Dr. O’Gara’s contribution to inter-church dialogues in Canada, highlighted some themes of her ecumenical theology, and envisioned the future for ecumenism in Canada. As one audience member observed, Margaret’s spirit was truly present in the room. For the rest of the morning, Forum participants split into three groups to participate in workshops on aspects of inter-church dialogue. Dr. Darren Dahl, Director of the Prairie Centre for Ecumenism, led a workshop on receptive ecumenism. A group guided by Mr. Nicholas Jesson, Bishop’s Assistant for Ecumenical Relations, Roman Catholic Diocese of Saskatoon, and Dr. Mary Marrocco, Associate Secretary for the Commission on Faith and Witness, discussed the topic of ecumenism and theological education. Rev. Nobuko Iwai, United Church of Canada, presented on the topic of ecumenical shared ministries. In the afternoon, Forum participants came back together to engage in panels on national and local dialogues in Canada. Dr. Gail Allan and Sr. Donna Geernaert shared their experiences of Roman Catholic–United Church dialogue, celebrating its 40th anniversary, while Rev. Donald Koots spoke about the evolving dialogue between the Anglican and the United Churches of Canada. The Rev. André Lavergne reflected on the experience of the Evangelical Lutheran and Anglican Churches in Canada, whose ecumenical dialogue has led to a full communion partnership. This relationship, he noted, is unique. The churches live in true Christian unity, celebrating the Eucharist together and sharing in ministry while allowing some theological tensions to remain unresolved. The rest of the afternoon was dedicated to local dialogues. Mr. Norman Lévesque (Canadian Centre for Ecumenism) shared results of “on-the-ground” ecumenism in Quebec, while other panellists spoke from their experiences of lively dialogue in Saskatoon, which has often been called “the hotbed of ecumenism”. Pastor Harry Strauss and Father Geoffrey Young shared a statement, Called to Common Witness (2015), the fruit of local Evangelical-Catholic dialogue. Although this statement sincerely acknowledges some central differences, it confesses the shared faith of the two communities, hoping to attain “greater understanding and appreciation of [their] respective beliefs and traditions” and offering “a vision of potential collaborative action”. Rev. Jordan Cantwell and Mr. Tim Jelinski, representing local United–Catholic dialogue, highlighted the vital importance of lay participation in the local ecumenical conversation. 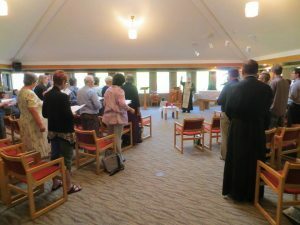 In deep and cordial discussion, members not only learn about the faith of their dialogue partners but also delve deeper into their own tradition. Moreover, as Rev. 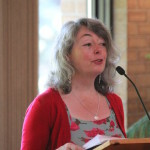 Cantwell noted, the participants’ love for one another as earnest disciples of Christ challenges them to approach points of genuine theological division not as provocations to rejection and conflict, but as opportunities for learning. The event concluded with a chance to reflect on the rich offerings of the Forum. The respondent, Fr. Bernard de Margerie, founding Director of the Prairie Centre for Ecumenism and beloved Roman Catholic ecumenical leader, asked the participants to share an aspect of the Forum that proved a “conversion moment” for them, breaking open the Word of God on reconciliation. Finally, a keynote address was delivered by Dr. Timothy George, dean of Beeson Divinity School (Homewood, Alabama), chair of the Doctrine and Christian Unity Commission of the Baptist World Alliance, and a renowned Baptist theologian. Dr. George’s talk, “Vatican II and the Quest for Christian Unity”, situated the pronouncements of Vatican II in their historical context and highlighted the council’s desire to offer a positive, affirming vision for Christian unity in the midst of global conflicts. Before the closing worship, Dr. Darren Dahl, Director of the Prairie Centre for Ecumenism, which hosted this year’s Canadian Forum on Inter-Church Dialogues, passed a candle, symbolizing the passion for Christian unity through dialogue, to Norman Lévesque, representing the Canadian Centre for Ecumenism, which will host the Forum in 2018 in Montreal.